Born in 1950, Kim is known for paintings that borrow elements from traditional calligraphy and “muninhwa,” or philosophical paintings with stylish brushstrokes. Using traditional brushes, ink and mulberry paper, Kim attempts to reinvent traditional paintings. Kim has tried to leave his paintings emptier than before. “If I had tried to include more and more on the paper in the past, I recently started to empty the space, yet include an essence,” Kim said. There is less is on the paper, but he said doing so took double and triple the effort. “I painted just a few lines with very thick brushes. I don’t know. Young people could have painted these lines more easily, but I toiled to come up with these lines. I failed many times, and these works are the ones that survived,” Kim said. Kim, who has mainly used brushes for more than 30 years, is, however, open to using different tools. Rhythm and flow -- qualities found in water in East Asian philosophy such as that of Lao Tzu -- are important elements in Kim’s paintings. “Without water, there is nothing left in the spirit of the East,” he said. “I listened to jazz, when painting this landscape painting. It helped me to keep the rhythm,” Kim added. 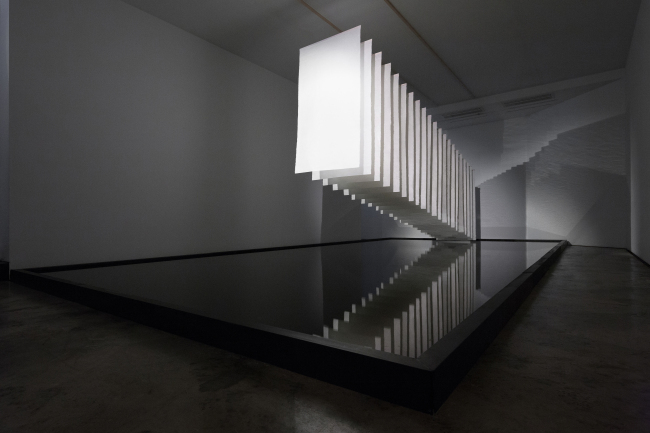 Water and its flow are ruling themes in his installation works “Suddenly-Drawing the Space” (2019) and “Gap-Between” (2019). “Suddenly-Drawing the Space,” which comprises a 4-by-10-meter ink-stone-like bottom filled with black ink and mulberry paper sheets floating above, is also characterized by the ripples of the liquid on the surface. 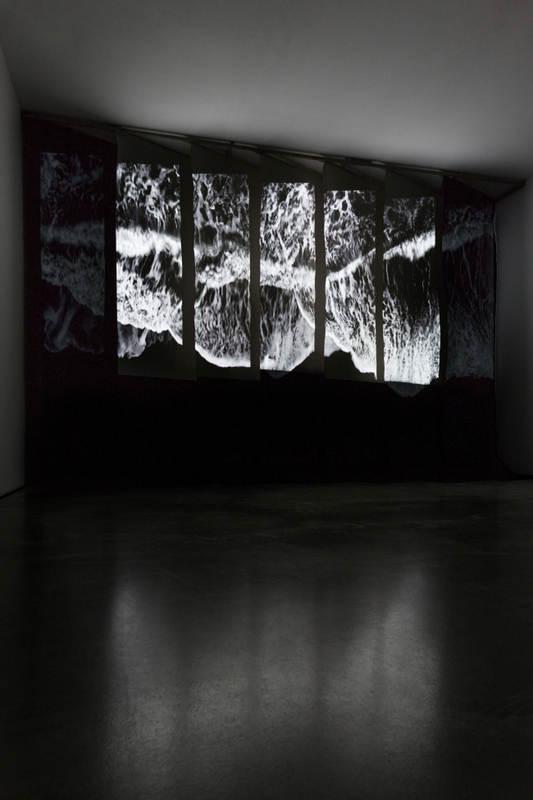 In “Gap-Between,” Kim projects a video that captures the repeated movements of waves on the beach onto the white space of layers of cotton that have been painted black and white. The exhibition runs through April 7.